The kind people at Knowledge Adventure recently offered me a free membership, and asked me to try out and review JumpStart's 3D Virtual World for kids. I have used JumpStart products in the past, both as a teacher and a parent, and always have been impressed with their games, which reinforce and teach skills that children are learning at school, yet are fun to play. 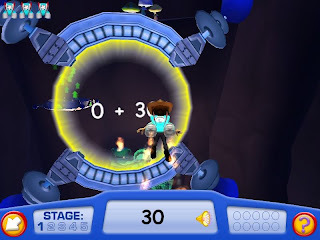 From their website: "JumpStart is an award-winning adventure-based 3D virtual world that is super-personalized, wildly imaginative and really fun, but don't let that fool you - it also teaches math, reading, and critical thinking skills so kids get a real jump start in life." My girls have never been big computer or video game users, so I was curious to see how they would like the JumpStart website. We've owned a few of the popular gaming systems, yet they just don't ask to play any of them that often. They'd much prefer to play with their toys. However, after spending just a few minutes on JumpStart, they were hooked. 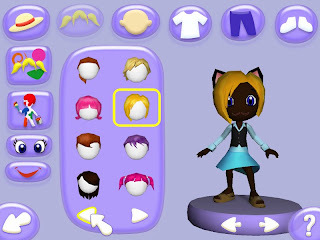 Boo played first and loved that she could create her own "Jumpee," (avatar) character, picking out everything from hair color to clothing and choosing a name. She spent quite a long time doing this, wanting her Jumpee to look just like herself. Instead of going off and doing something else, her older sister Kiki was right there next to her watching, and helping her as she needed it. After Boo created her Jumpee, she immediately went off exploring. 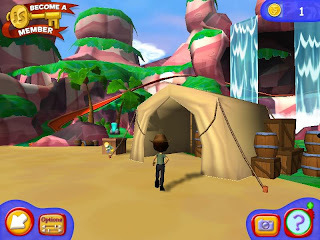 There are many areas to explore, including two virtual worlds, "Storyland" (ages 3-5) and "Adventureland" (ages 6-8). 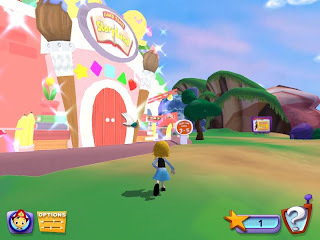 I started Boo off in Storyland, even though she is 6, since this was her first time playing. She doesn't play computer games that often and I wanted her to feel comfortable and get used to the game first before having more challenging activities thrown at her. I like the ease of navigation in this software. In Storyland, for example, the child can just use the mouse instead of navigating a keyboard to find her way around. Kiki started off in Adventureland first, and had no problems at all figuring it out. Like Storyland, the child is first prompted to create a Jumpee character. Since it is geared towards older children, the challenges are a bit harder, and the keyboard and mouse are both needed to navigate the world. There is also more reading involved, and of course the learning games are a bit harder. I really like the way JumpStart caters to different age groups. Storyland is very simple for kids to explore, yet challenging enough to keep their interest. I also like that they get oral instructions and can ask for help, just by clicking on a question mark symbol in the corner of the screen, as frequently as they need it. They also have tasks to complete and are rewarded with stars when they complete a task. 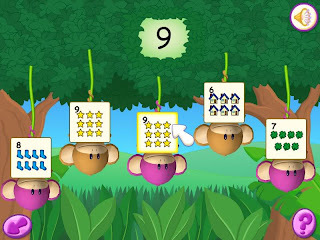 When they finish one of the many learning games within their "land," they are rewarded with coins, which in turn they can spend on virtual clothing and objects for their Jumpee. I also like that as the child completes tasks or "missions" the game gets a little harder, and keeps the child's interest. Because it is online, the game continues to change and be fun for kids to play, unlike CD games which often come to an end after a child completes all of the tasks. The fun is just beginning, as JumpStart creators are continuing to add more to the site, including "Futureland," which will be geared toward kids in 3rd through 5th grade, and "Marineland," an extension of Adventureland. They also recently launched a multi-player feature, which allows the Jumpees to interact with each other and chat for even more fun. Because real names are never used, and the chat is "canned" (children pick from a menu of phrases, such as "Hello, how are you today?") this keeps the conversation safe and secure for your little ones. With all of these features to explore, I know my girls will never be bored again on a rainy day! The wonderful people at Jumpstart.com have offered to give away a free 3-month membership (value of $24) to one lucky reader. Membership includes access into a members-only area, software downloads, and more! 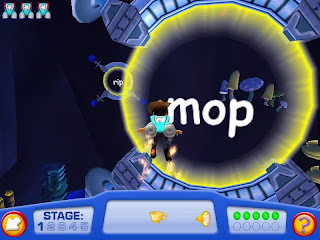 To enter, go to Jumpstart.com and check out the free areas in the virtual world, and then come back here and leave a comment telling me what you/your child liked about it. You can also earn additional entries by tweeting about this contest/post using the hashtag #momexperience with a link to this post. Contest is open to US residents, and ends at 11:59 EST Sunday, September 13, 2009. The winner will be contacted via email (so be sure to leave me a valid email address) within two days of the contest end. Good luck! CONGRATS to DesignHERmomma for winning my first ever giveaway! Thanks to everyone who participated! And I am tweeting and commenting! Teagan is just starting to really get interested in computers. They have computer time at school each day and she gets on PBS Sprout and on Starfall at home sometimes. This is something she could really enjoy and it's a learning tool to boot! Plus... I think I'd have fun playing with it! I like that it looks really educational as well as fun to play! I'm sure if PK got this, I would have to pry her away from it! just tweeted it out! Crossing my fingers! Our little ones are enjoying this, I didn't Jump Start had this. Playing the games makes learning more fun.! Do we get extra entries for each tweet? Absolutely! Tweet away. . .
Hey you! I know. I would love to blog again, I just don't see it happening as that would require some intellegent thought and effot toward that particular undertaking. Right now I barely have time to keep up with the laundry. I do miss it, though. Thank you for sending me this way to enter for this. The girls would absolutely flip out over something like this. Especially Mallory. She really likes PBSkids.org, and sites like that with their games. Have a wonderful long weekend!